The Neverending Story film is etched into the 80s portion of my childhood along with The Dark Crystal and Labyrinth and other such incredible fantasy (I don't say this mockingly). It wasn't until much later in life that I discovered the film was based on a book! Somewhere in my 20s I read it like drinking water and it was such an expanding experience that's hard to put into words. Depth and richness and more was added to not just my nostalgia, but something that is a tiny building block of who I am. Sounds crazy, huh? But there it is. It's an amazing and layered book that is oh, so much more than the film (can you tell that I recommend it?). Because The Neverending Story is connected to my childhood, and I was born in Germany, and this story is German (!! 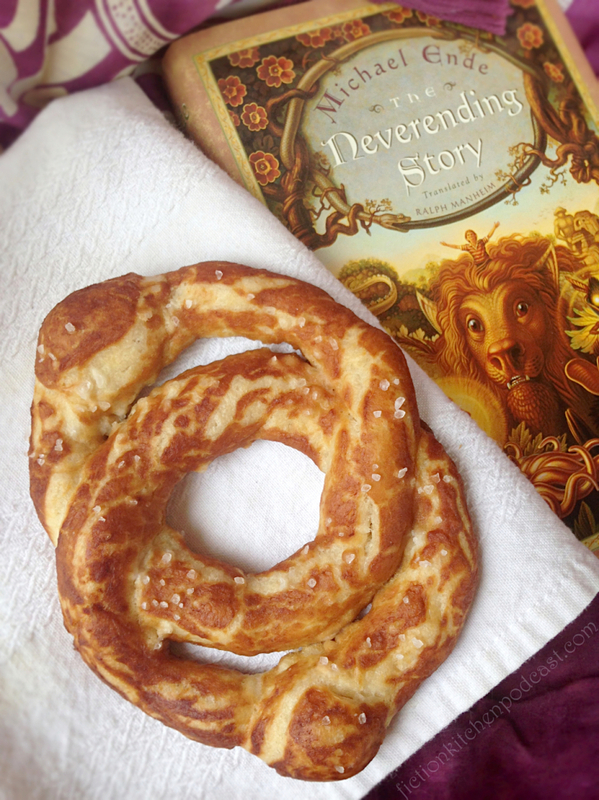 Translated by Ralph Mannheim), and one of my memories of Germany is warm soft pretzels bought from street vendors, I decided to make pretzels in the shape of the eternal AURYN from the story. 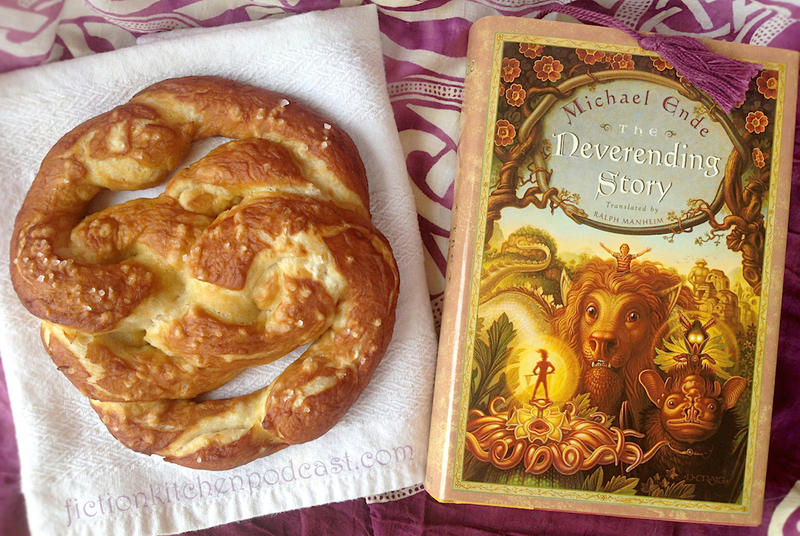 There are two different versions of the AURYN; one (the one shown above) is from the film, the other (shown below) is from the book. Take your pick with which one you'd like to tackle; the book one is definitely more manageable! Pour the yeast, 1/2 tsp. sugar, & 3/4 cup hot water into a large mixing bowl & let sit for about 10 minutes to become foamy. In a separate bowl whisk together the flour & 1 tsp. salt. Add the 1/4 cup sugar & oil into the yeast mixture & begin to mix it on low speed using a dough hook attachment. Add in the flour mixture, a little at a time, until the dough pulls away from the sides of the bowl & is smooth & elastic. 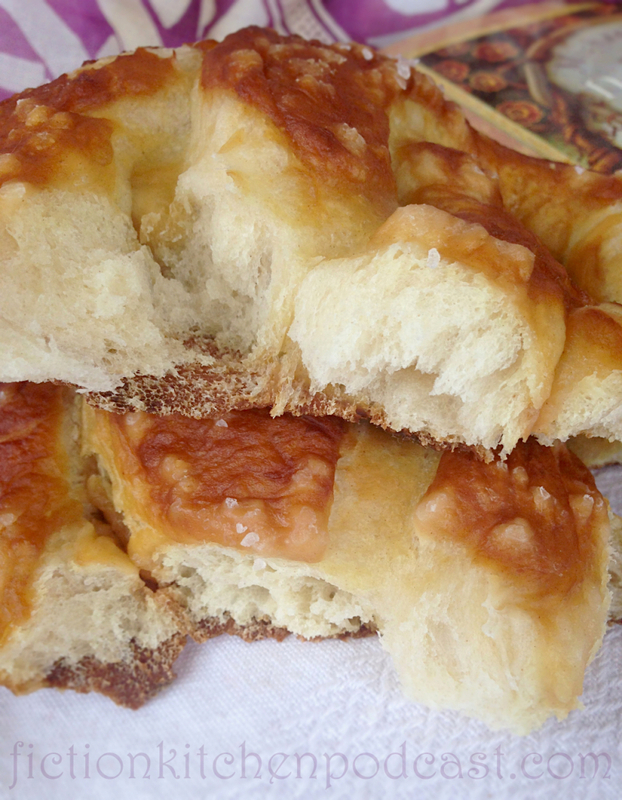 Put a little oil on your hands & remove the dough from the bowl. Lightly oil the inside of the bowl & then place the dough back in. Lay a damp kitchen towel over the top & place the bowl of dough in the oven with the oven light on for about 2 hours to rise. Lightly oil your hands again & punch down the dough. Remove it from the bowl & stuff it into a plastic baggie, removing the air before sealing it. Place the bag of dough into the fridge for an hour or so. Line a tray with parchment paper & remove the dough from the fridge. Separate the dough into 6 equal sections. Roll two sections into long, finger-width ropes. Working on the parchment paper, carefully curve & overlap the dough ropes into the Auryn shape (break & reform the strips as needed). 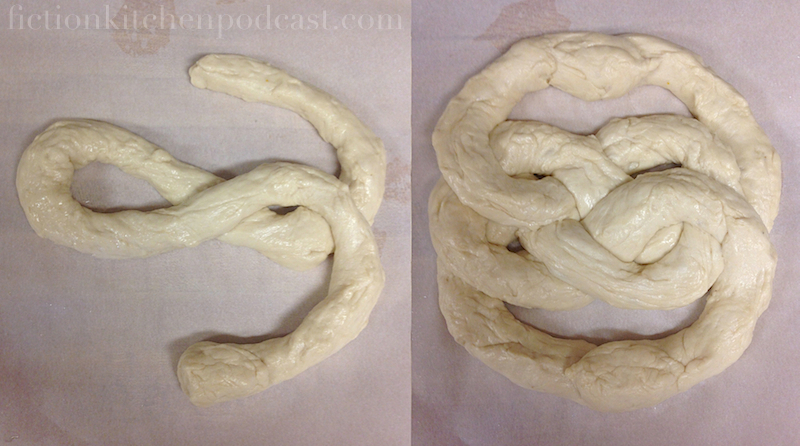 Do this with the remaining pairs of dough. Place the tray with the auryns into the freezer for about 30 minutes. Heat your oven to about 415°F. In a medium pot, bring the baking soda & 3 cups of water to a rolling boil. Remove the auryns from the freezer &, one-by-one, dip them in the boiling water for a quick instant, removing them with a large slotted spatula, deep fryer scoop, or Chinese strainer. Let the excess water drip back into the pot & gently lay the auryns onto the parchment again. Transfer the paper with the auryns on it to a new baking tray (because the previous one is cold!) & sprinkle the auryns lightly with course sea salt or pretzel salt. Slide the tray into the oven & bake for about 10 minutes, or until the pretzels are a deep golden brown. Remove from the oven & lift the parchment with the pretzels on it from the hot tray. Brush the pretzels with melted butter & sprinkle with a little more salt if desired.